Amanzi for Food is funded by the Water Research Commission (WRC), led and implemented by the Environmental Learning Research Centre at Rhodes University. There is growing concern about the need to improve our children’s nutrition by providing fresh healthy foods. There are also calls to support, in particular, women farmers in growing fresh healthy foods to feed their families and communities. A reliable supply of good quality water is essential to growing food. ‘Water is life’. As the user of 62% of South Africa’s available water, agriculture has a major responsibility to ensure the most efficient use of this most precious of resources. South Africa is a water scarce country with all the available surface water resources already being used. This situation is likely to become even more serious as our climate becomes more extreme and more unpredictable. In South Africa there are signs that rainfall is likely to be reduced in the central and western areas of the country. Amanzi for Food aims to help everyone involved in the growing of our food to implement different ways of harvesting, storing, and using rainwater to improve food production. The people involved with Amanzi for Food include farmers, extension services, agricultural education and training institutions and agricultural NGOs and CBOs. 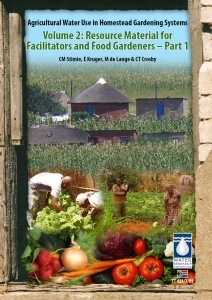 They learn together and implement different ways of harvesting, storing, and using rainwater according to their needs, to improve food production. We refer to all these activities as ‘Rainwater Harvesting and Conservation’ (RWH&C). 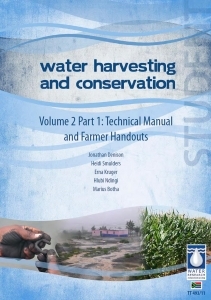 The Water Research Commission has worked with many people over the years to gather information and develop materials on different methods of using rainwater for food production. (Jonathan Denison, Heidi Smulders, Erna Kruger, Hlubi Ndingi, Marius Botha, WRC, Pretoria, 2011). (CM Stimie, E Kruger, M de Lange, CT Crosby, WRC, Pretoria, 2010). The main purpose of this website is to share this information as widely as possible. All of these materials can be downloaded and used by anyone. There are no restrictions on their use, but if the materials are used, they should be duly acknowledged.